Chances are you’ve gotten an e-mail from someone on a campus somewhere today. That’s not necessarily good news. 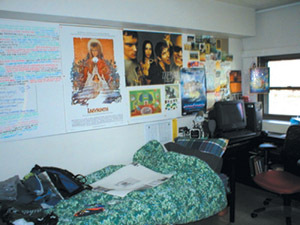 Dorm.jpg: almost like being there. What I’m wrong about this time has to do with my own baby as she went off to college: my expectation (recorded in this space last August) that she’d no longer be a part of my daily life. Now, thanks to Instant Messenger, e-mailed attachments, and URLs, I not only heard from my daughter most days last fall but also got images—her bulletin board (Dorm.jpg), a Latin class toga party, and a closeup of her school’s version of mystery meat, an item listed on the cafeteria menu as “Dead Horse Ranch Red Chili Enchiladas.” She even sent syllabi—her Intro to Sociology course, I’m happy to report, featured lots of Chicago names. According to the January 6 New York Times front-page story “Parents’ Role is Narrowing Generation Gap on Campus,” I’m not alone in my surprise at how often the kids write home. While writing home, they’re also surfing, IMing buddies across campus and country, and posting papers to course discussion groups. On the first Monday in December the U of C received hard proof of just how much its denizens use e-mail: what the campus Chronicle described as “an unprecedented breakdown” of the University’s Networking Services and Information Technologies (NSIT) e-mail system, which processes 500,000 messages daily (of 12,000 active accounts, 3,000 are connected to the server at any moment). The culprit? A rare convergence of hardware and software failures and overloads squared by the fact that more and more users are sending out more, larger, and more complicated messages. Adding to the problem, says the University’s chief information officer, Greg Jackson, many campus e-mailers still prefer the older, system-intensive POP protocol rather than the newer IMAP protocol NSIT recommends. “Deep into the Landscape” discusses the pioneering work of Oriental Institute director emeritus Robert Braidwood, PhD’43. As we went to press, the Magazine learned of the January 15 deaths of Braidwood and his wife and colleague, Linda Braidwood, AM’46. Obituaries will appear in the April issue.